Ultra light and slim design. Commit to provide first-class quality products. Made of environmental friendly and light weight material. 2. Cell phone may suffer hydraulic pressure under certain water depth , which will impact the the operation of the touchscreen. Please take photos by volume buttons in this case. 3. Please do Water Test according to the User Manual before placing phone in the case or before you take it to swimming pool, beach or anywhere has water. Ensure all the seams are closed. Safety - a simple snap and lock access, easy to keep out water, snow, dust, sand, and dirt.Easily attaches for safe, easy carrying when swimming. Lightweight Full Body Protectiv Waterproof Cases are incredible value. Not only are they light but also durable. 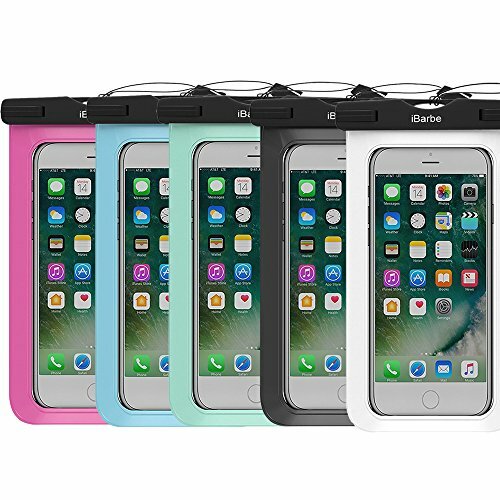 Slim Waterproof Case, iBarbe Universal Cell Phone Dry Bag Pouch Underwater Cover Full Body Protective Shockproof Snowproof Dirtproof Waterproof Case. Protection - Provides waterproof protection for your cell phones, MP3 players, or PDA while maintaining full touch screen functionality. Easily for travel, swimming and go boating with no worries. This slim waterproof phone cover is designed not to hinder touch screen use even underwater. Transparent cover all around so as not to block the camera use. Free Operation and Plastic,Silicone Rubber ,TPU Transparent Cover - You can perfectly operate your cellphone devices such as Apple iPhone X/iPhone 7/iPhone 7 PlusiPhone 6S, 6S+, 6, 6P, 5, 5C & 5S, HTC One/One X/X+, samsung galaxy Note 5 s8 s8 plus S7 S6 Edge s5 Note 2, Note 3, Nexus 4 , Droid Incredible, Droid DNA, Windows Phone 8X, Nokia Lumia and Samsung Galaxy S6, S5, S4, S3 and other electronic devices. IPX8 - Protection Even Underwater NOTE: 1. Phones with large otterbox or other large case are not recommended in this bag! 2. Cell phone may suffer hydraulic pressure under certain water depth , which will impact the the operation of the touchscreen. Please take photos by volume buttons in this case. 3. Easy to operate the touch screen functions.but for iPhone 7/ 7plus, it's NOT for touch ID fingerprint. If you have any questions about this product by iBarbe, contact us by completing and submitting the form below. If you are looking for a specif part number, please include it with your message.